Stalking is a rarely talked about offense. When we do talk about stalking, it is usually in a humorous aspect. Maybe you run into a friend three times in one day and that last time you tell them “Stop stalking me!” in a joking way. Unfortunately, for some stalking is a very real, life interrupting, scary, and prolonged event. Stalking can go on for years. Stalking can be done in a wide variety of ways. Such as making threats to someone and/or their friends and family, communication that is not reciprocated such as repeated texts/phone calls/emails, and repeated physical or viewable closeness (waiting for someone to arrive to a location, following them, watching them from a distance). 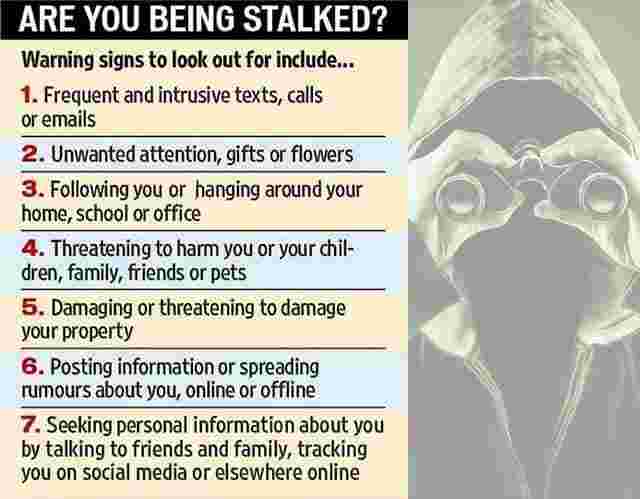 Stalking can also be done by installing cameras in someone’s home or other area to have an eye into their personal life, installing tracking software, and even using spyware to track online activity. ⦁ According to the National Center for Victims of Crime, 1,006,970 women and 370,000 men are stalked annually in the United States. So, what should you do if you are the victim of stalking? Obviously, try to avoid the person who is stalking you. This can be hard if the person is close to you or your family. If the stalking is taking place through text, email, social media, etc. make it clear that you wish for the communication to stop and do not respond to any further messages. Keep records of the texts, emails, etc. by screenshotting or printing. Tell your friends, family, and even co-workers about the situation. If you have kids, it may be helpful to have codeword to let them know they need to leave or call the police. Think about (and by all means do) reporting the stalking to law enforcement. It is also helpful to keep a journal or record of the incidents. This will be helpful if you report it and if it goes to court. I’ll dive deeper into cyberstalking, because that is a huge possibility and tactic today. The internet is full of personal information. Be careful about what you put out there. Make your accounts private, don’t post personal info (phone number, email, etc.) and only add people you know. Cyberstalking is indeed dangerous and hurtful to the victim. The victim can experience high amounts of stress, nightmares, sense of lost of safety, etc. If you feel that the computer you’re using is bugged, use a public computer such as at a library or church. 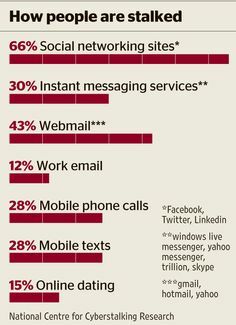 Younger people experience cyberstalking and online harassment most often. An estimated 65% of online users, ages 18-29, have experienced online harassment. Around half of victims do not know who is harassing them, about 38% said it was from a stranger. Social media is the biggest tool for a harasser. If you or someone you know is being stalked, don’t be afraid to ask for help. Reach out to someone. You do not have to endure this alone. Stalking is a very real and very serious happening. If someone you know is being stalking, do not blame them. Listen and show your support. Listen to the choices they would like to make to handle it. Also, take steps for your own safety. There are resources for those being stalked. You can visit victimsofcrime.org, call (855-484-2846) for immediate assistance, and you can contact Humboldt Ava for help with a situation. We are here for you. Of course, if you are in immediate danger call 911.